In a second questioning by British parliamentarians, Murdoch, who is fighting to keep his place in his father Rupert’s media empire, said he was ill-informed by then-editor Colin Myler and should have been told more when he approved a large payoff to a hacking victim. “This was the job of the new editor who had come in... to clean things up, to make me aware of those things," said Murdoch, appearing confident under interrogation by lawmakers. News Corp long maintained that the hacking was the work of a lone, “rogue" reporter and a private detective who both went to jail for the offence in 2007. Murdoch approved the payoff to hacking victim and soccer boss Gordon Taylor in 2008. Myler and Tom Crone, the former legal chief of the News of the World, have contended that they did made Murdoch aware in 2008 that Taylor had in his possession transcripts of hacked phone conversations that seemed to implicate other journalists. Murdoch reiterated on Thursday that Myler and Crone had not shown him the transcripts, contained in an email dubbed the “For Neville" email, and said Crone had misled parliament. Opposition Labour Party MP asked Murdoch: “Do you think Mr Crone misled us?" Murdoch answered: “It follows that I do, yes." Murdoch denied that he himself had misled the parliamentary select committee, although he did express some regret, in contrast to his July appearance before the committee. “At various times, and I am sorry for this, the company moved into an aggressive defence too quickly," he said. 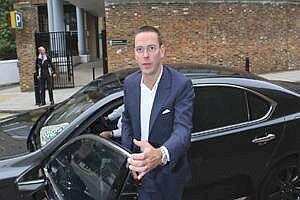 James Murdoch was brought into News International after the date of the last known phone-hacking, but has been accused of failing to ask the right questions at least, and possibly of participating in a huge corporate cover-up. He is currently deputy chief operating officer of News Corp with responsibility for all its non-U.S. business, and was until recently expected to take over sooner or later from his father, chief executive Rupert Murdoch. He is also still chairman of News International, News Corp’s British newspaper arm. An admission by News International this week that the News of the World ordered the surveillance of lawyers representing hacking victims as recently as this year have added to the impression that the culture may not have changed significantly. Murdoch’s appearance is being streamed live at www.parliamentlive.tv.